I was supposed to be taking the night off. Don was at work, and I had the house to myself for the evening (which certainly is not a common occurrence). I had considered diving head first into a bag of chips for dinner, but then I got the dreaded phone call: Don needed me to bring him something to eat because he wasn’t going to get the chance to get away for a break. So much for a Doritos dinner. I hadn’t planned anything, so it was going to be a scrounged up meal. And I wasn’t in to making a big, fancy affair either – it was going to have to be quick and simple. I’d bought chicken breasts the day before and had thrown them in the fridge (just too lazy to prep them and store them in the freezer like I should have – lucky me). I had some grape tomatoes that didn’t have any plans and I always have lemons, garlic, onions, and shallots. Then there’s always the trusty canned goods that are in the back of the pantry and seldom used. I don’t know why I always keep them, but they’re there: canned pumpkin, black olives, a few different types of beans, and the artichokes. None of which I use regularly (or even crave all that often), but once in a while something comes in handy. This was one of those times. Since pumpkins didn’t work with chicken and tomatoes (and I just was not feeling the olives that night), artichokes seemed like the only viable option. So I set about throwing things into the sauté pan. To round out the flavor, I threw in a little rosemary. And darned if it didn’t turn out tasting pretty good, too. I mean, lemon and garlic are naturals for artichokes (and chicken – and tomatoes too for that matter). Then I tossed in a little fresh parsley, just to brighten it all up after the trip through the pan. Then I threw it all on some firm polenta just to round out the plate. Even though I hadn’t planned on it, I ended up taking pictures and writing down the recipe before it fell out of my head (which doesn’t take too long anymore). And wouldn’t you know it: just about the time I was packing it up to run it to Don, he called. Turns out that he wasn’t going to have time to eat after all, and he was calling to tell me that I didn’t need to make anything for him. Ugh. Well, at least it wasn’t a total loss – I got a recipe I wasn’t planning on, even if it cost me a night off. But I’ll tell you what, next time Don calls at the last minute asking me to bring him dinner, he’s getting a bag of Doritos – or the canned pumpkin. Slice each chicken breast like you were going to butterfly it, cutting it in two, creating a total of four chicken breast pieces. Sauté chicken breasts until browned, 2-3 minutes per side. Remove from pan, cover and reserve. Reduce heat to medium, and in the same pan add shallot, red pepper flakes, garlic, rosemary, and lemon zest. Cook until shallot is translucent, but not browned, 2-3 minutes. Add grape tomatoes and salt & pepper to taste. Sauté until tomatoes start to give off their juices, 5-7 minutes. Add artichoke hearts and heat through, 2-3 minutes. Stir in lemon juice and chopped parsley. Place about ¼ of the tomato artichoke mixture on top of each chicken breast piece. Serve on firm polenta, mashed potatoes, or your favorite starch dish. 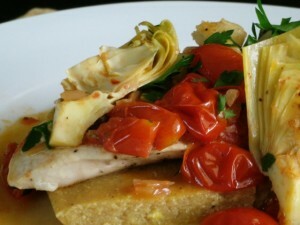 This entry was posted in Cooking and tagged artichoke, chicken, dinner, tomato. Bookmark the permalink.